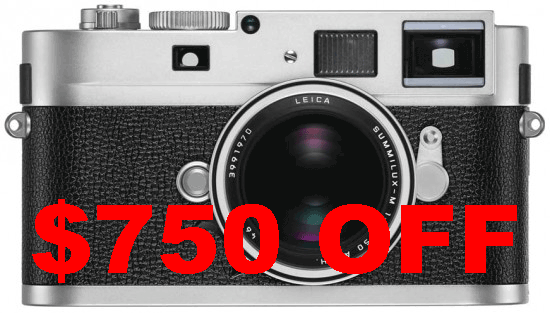 « Leica M 240 US price increase rescinded? I already reported few days ago that Leica has canceled their price increase plans for the US. A proof for that is today's news that the company has extended their current discounts ($750 off the M 240 and $250 off M lenses) till March 31, 2015. Leica also introduced a new $750 instant saving on the Leica Monochrom camera (valid for both black and silver models). The new Monochrom price is now $7,200. At the time of this post only B&H had the new pricing active online, but in the next few hours the discount should be reflected also at Adorama, Amazon, Leica Store Miami and Leica Store San Francisco (use M750 code upon checkout for the M240 and Monochrom and MLENS code for M lenses). The current Leica Monochrom is rumored to be replaced by a new model in the next 2 months. This entry was posted in Deals, Leica M, Leica M Monochrom. Bookmark the permalink. Trackbacks are closed, but you can post a comment.